The Islamic Golden Age was a period of cultural, economic and scientific flourishing in the history of Islam, traditionally dated from the 8th century to the 14th century. 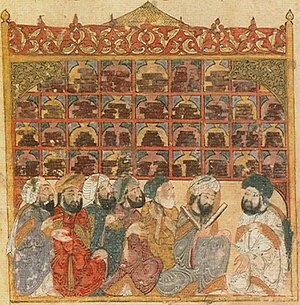 This period is traditionally understood to have begun during the reign of the Abbasid caliph Harun al-Rashid (786 to 809) with the inauguration of the House of Wisdom in Baghdad, where scholars from various parts of the world with different cultural backgrounds were mandated to gather and translate all of the world's classical knowledge into the Arabic language. This period is traditionally said to have ended with the collapse of the Abbasid caliphate due to Mongol invasions and the Siege of Baghdad in 1258 AD. A few contemporary scholars place the end of the Islamic Golden Age as late as the end of 15th to 16th centuries. Expansion of the Caliphates, 622–750. The metaphor of a golden age began to be applied in 19th-century literature about Islamic history, in the context of the western aesthetic fashion known as Orientalism. The author of a Handbook for Travelers in Syria and Palestine in 1868 observed that the most beautiful mosques of Damascus were "like Mohammedanism itself, now rapidly decaying" and relics of "the golden age of Islam". There is no unambiguous definition of the term, and depending on whether it is used with a focus on cultural or on military achievement, it may be taken to refer to rather disparate time spans. Thus, one 19th century author would have it extend to the duration of the caliphate, or to "six and a half centuries", while another would have it end after only a few decades of Rashidun conquests, with the death of Umar and the First Fitna. During the early 20th century, the term was used only occasionally, and often referred to the early military successes of the Rashidun caliphs. It was only in the second half of the 20th century that the term came to be used with any frequency, now mostly referring to the cultural flourishing of science and mathematics under the caliphates during the 9th to 11th centuries (between the establishment of organised scholarship in the House of Wisdom and the beginning of the crusades), but often extended to include part of the late 8th or the 12th to early 13th centuries. Definitions may still vary considerably. Equating the end of the golden age with the end of the caliphates is a convenient cut-off point based on a historical landmark, but it can be argued that Islamic culture had entered a gradual decline much earlier; thus, Khan (2003) identifies the proper golden age as being the two centuries between 750–950, arguing that the beginning loss of territories under Harun al-Rashid worsened after the death of al-Ma'mun in 833, and that the crusades in the 12th century resulted in a weakening of the Islamic empire from which it never recovered. The Islamic Empire heavily patronized scholars. The money spent on the Translation Movement for some translations is estimated to be equivalent to about twice the annual research budget of the United Kingdom’s Medical Research Council. The best scholars and notable translators, such as Hunayn ibn Ishaq, had salaries that are estimated to be the equivalent of professional athletes today. The House of Wisdom was a library established in Abbasid-era Baghdad, Iraq by Caliph al-Mansur. During this period, the Muslims showed a strong interest in assimilating the scientific knowledge of the civilizations that had been conquered. Many classic works of antiquity that might otherwise have been lost were translated from Greek, Persian, Indian, Chinese, Egyptian, and Phoenician civilizations into Arabic and Persian, and later in turn translated into Turkish, Hebrew, and Latin. Christians, especially the adherents of the Church of the East (Nestorians), contributed to Islamic civilization during the reign of the Ummayads and the Abbasids by translating works of Greek philosophers and ancient science to Syriac and afterwards to Arabic. They also excelled in many fields, in particular philosophy, science (such as Hunayn ibn Ishaq, Thabit Ibn Qurra, Yusuf Al-Khuri, Al Himsi, Qusta ibn Luqa, Masawaiyh, Patriarch Eutychius, and Jabril ibn Bukhtishu) and theology. For a long period of time the personal physicians of the Abbasid Caliphs were often Assyrian Christians. Among the most prominent Christian families to serve as physicians to the caliphs were the Bukhtishu dynasty. The Christian physician Hunayn ibn Ishaq led the House of Wisdom. Throughout the 4th to 7th centuries, Christian scholarly work in the Greek and Syriac languages was either newly translated or had been preserved since the Hellenistic period. Among the prominent centers of learning and transmission of classical wisdom were Christian colleges such as the School of Nisibis and the School of Edessa, the pagan University of Harran and the renowned hospital and medical academy of Jundishapur, which was the intellectual, theological and scientific center of the Church of the East. The House of Wisdom was founded in Baghdad in 825, modelled after the Academy of Gondishapur. It was led by Christian physician Hunayn ibn Ishaq, with the support of Byzantine medicine. Many of the most important philosophical and scientific works of the ancient world were translated, including the work of Galen, Hippocrates, Plato, Aristotle, Ptolemy and Archimedes. Many scholars of the House of Wisdom were of Christian background. Among the various countries and cultures conquered through successive Islamic conquests, a remarkable number of scientists originated from Persia, who contributed immensely to the scientific flourishing of the Islamic Golden Age. According to Bernard Lewis: "Culturally, politically, and most remarkable of all even religiously, the Persian contribution to this new Islamic civilization is of immense importance. The work of Iranians can be seen in every field of cultural endeavor, including Arabic poetry, to which poets of Iranian origin composing their poems in Arabic made a very significant contribution." Science, medicine, philosophy and technology in the newly Islamized Iranian society was influenced by and based on the scientific model of the major pre-Islamic Iranian universities in the Sassanian Empire. During this period hundreds of scholars and scientists vastly contributed to technology, science and medicine, later influencing the rise of European science during the Renaissance. With a new and easier writing system, and the introduction of paper, information was democratized to the extent that, for probably the first time in history, it became possible to make a living from only writing and selling books. The use of paper spread from China into Muslim regions in the eighth century, arriving in Al-Andalus on the Iberian peninsula (modern Spain and Portugal) in the 10th century. It was easier to manufacture than parchment, less likely to crack than papyrus, and could absorb ink, making it difficult to erase and ideal for keeping records. Islamic paper makers devised assembly-line methods of hand-copying manuscripts to turn out editions far larger than any available in Europe for centuries. It was from these countries that the rest of the world learned to make paper from linen. The centrality of scripture and its study in the Islamic tradition helped to make education a central pillar of the religion in virtually all times and places in the history of Islam. The importance of learning in the Islamic tradition is reflected in a number of hadiths attributed to Muhammad, including one that instructs the faithful to "seek knowledge, even in China". This injunction was seen to apply particularly to scholars, but also to some extent to the wider Muslim public, as exemplified by the dictum of Al-Zarnuji, "learning is prescribed for us all". While it is impossible to calculate literacy rates in pre-modern Islamic societies, it is almost certain that they were relatively high, at least in comparison to their European counterparts. Education would begin at a young age with study of Arabic and the Quran, either at home or in a primary school, which was often attached to a mosque. Some students would then proceed to training in tafsir (Quranic exegesis) and fiqh (Islamic jurisprudence), which was seen as particularly important. Education focused on memorization, but also trained the more advanced students to participate as readers and writers in the tradition of commentary on the studied texts. It also involved a process of socialization of aspiring scholars, who came from virtually all social backgrounds, into the ranks of the ulema. For the first few centuries of Islam, educational settings were entirely informal, but beginning in the 11th and 12th centuries, the ruling elites began to establish institutions of higher religious learning known as madrasas in an effort to secure support and cooperation of the ulema. Madrasas soon multiplied throughout the Islamic world, which helped to spread Islamic learning beyond urban centers and to unite diverse Islamic communities in a shared cultural project. Nonetheless, instruction remained focused on individual relationships between students and their teacher. The formal attestation of educational attainment, ijaza, was granted by a particular scholar rather than the institution, and it placed its holder within a genealogy of scholars, which was the only recognized hierarchy in the educational system. While formal studies in madrasas were open only to men, women of prominent urban families were commonly educated in private settings and many of them received and later issued ijazas in hadith studies, calligraphy and poetry recitation. Working women learned religious texts and practical skills primarily from each other, though they also received some instruction together with men in mosques and private homes. Madrasas were devoted principally to study of law, but they also offered other subjects such as theology, medicine, and mathematics. The madrasa complex usually consisted of a mosque, boarding house, and a library. It was maintained by a waqf (charitable endowment), which paid salaries of professors, stipends of students, and defrayed the costs of construction and maintenance. The madrasa was unlike a modern college in that it lacked a standardized curriculum or institutionalized system of certification. Muslims distinguished disciplines inherited from pre-Islamic civilizations, such as philosophy and medicine, which they called "sciences of the ancients" or "rational sciences", from Islamic religious sciences. Sciences of the former type flourished for several centuries, and their transmission formed part of the educational framework in classical and medieval Islam. In some cases, they were supported by institutions such as the House of Wisdom in Baghdad, but more often they were transmitted informally from teacher to student. The University of Al Karaouine, founded in 859 AD, is listed in The Guinness Book Of Records as the world's oldest degree-granting university. 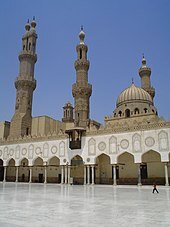 The Al-Azhar University was another early university (madrasa). The madrasa is one of the relics of the Fatimid caliphate. The Fatimids traced their descent to Muhammad's daughter Fatimah and named the institution using a variant of her honorific title Al-Zahra (the brilliant). Organized instruction in the Al-Azhar Mosque began in 978. Juristic thought gradually developed in study circles, where independent scholars met to learn from a local master and discuss religious topics. At first, these circles were fluid in their membership, but with time distinct regional legal schools crystallized around shared sets of methodological principles. As the boundaries of the schools became clearly delineated, the authority of their doctrinal tenets came to be vested in a master jurist from earlier times, who was henceforth identified as the school's founder. In the course of the first three centuries of Islam, all legal schools came to accept the broad outlines of classical legal theory, according to which Islamic law had to be firmly rooted in the Quran and hadith. The classical theory of Islamic jurisprudence elaborates how scriptures should be interpreted from the standpoint of linguistics and rhetoric. It also comprises methods for establishing authenticity of hadith and for determining when the legal force of a scriptural passage is abrogated by a passage revealed at a later date. In addition to the Quran and sunnah, the classical theory of Sunni fiqh recognizes two other sources of law: juristic consensus (ijmaʿ) and analogical reasoning (qiyas). It therefore studies the application and limits of analogy, as well as the value and limits of consensus, along with other methodological principles, some of which are accepted by only certain legal schools. This interpretive apparatus is brought together under the rubric of ijtihad, which refers to a jurist's exertion in an attempt to arrive at a ruling on a particular question. The theory of Twelver Shia jurisprudence parallels that of Sunni schools with some differences, such as recognition of reason (ʿaql) as a source of law in place of qiyas and extension of the notion of sunnah to include traditions of the imams. The body of substantive Islamic law was created by independent jurists (muftis). Their legal opinions (fatwas) were taken into account by ruler-appointed judges who presided over qāḍī's courts, and by maẓālim courts, which were controlled by the ruler's council and administered criminal law. Classical Islamic theology emerged from an early doctrinal controversy which pitted the ahl al-hadith movement, led by Ahmad ibn Hanbal, who considered the Quran and authentic hadith to be the only acceptable authority in matters of faith, against Mu'tazilites and other theological currents, who developed theological doctrines using rationalistic methods. In 833 the caliph al-Ma'mun tried to impose Mu'tazilite theology on all religious scholars and instituted an inquisition (mihna), but the attempts to impose a caliphal writ in matters of religious orthodoxy ultimately failed. This controversy persisted until al-Ash'ari (874–936) found a middle ground between Mu'tazilite rationalism and Hanbalite literalism, using the rationalistic methods championed by Mu'tazilites to defend most substantive tenets maintained by ahl al-hadith. A rival compromise between rationalism and literalism emerged from the work of al-Maturidi (d. c. 944), and, although a minority of scholars remained faithful to the early ahl al-hadith creed, Ash'ari and Maturidi theology came to dominate Sunni Islam from the 10th century on. Ibn Sina (Avicenna) and Ibn Rushd (Averroes) played a major role in interpreting the works of Aristotle, whose ideas came to dominate the non-religious thought of the Christian and Muslim worlds. According to the Stanford Encyclopedia of Philosophy, translation of philosophical texts from Arabic to Latin in Western Europe "led to the transformation of almost all philosophical disciplines in the medieval Latin world". The influence of Islamic philosophers in Europe was particularly strong in natural philosophy, psychology and metaphysics, though it also influenced the study of logic and ethics. Persian mathematician Muḥammad ibn Mūsā al-Khwārizmī played a significant role in the development of algebra, arithmetic and Hindu-Arabic numerals.He has been described as the father or founder of algebra. Another Persian mathematician Omar Khayyam is credited with identifying the foundations of algebraic geometry and found the general geometric solution of the cubic equation. His book Treatise on Demonstrations of Problems of Algebra (1070), which laid down the principles of algebra, is part of the body of Persian mathematics that was eventually transmitted to Europe. Yet another Persian mathematician, Sharaf al-Dīn al-Tūsī, found algebraic and numerical solutions to various cases of cubic equations. He also developed the concept of a function. Islamic art makes use of geometric patterns and symmetries in many of its art forms, notably in girih tilings. These are formed using a set of five tile shapes, namely a regular decagon, an elongated hexagon, a bow tie, a rhombus, and a regular pentagon. All the sides of these tiles have the same length; and all their angles are multiples of 36° (π/5 radians), offering fivefold and tenfold symmetries. The tiles are decorated with strapwork lines (girih), generally more visible than the tile boundaries. In 2007, the physicists Peter Lu and Paul Steinhardt argued that girih from the 15th century resembled quasicrystalline Penrose tilings. Elaborate geometric zellige tilework is a distinctive element in Moroccan architecture. Muqarnas vaults are three-dimensional but were designed in two dimensions with drawings of geometrical cells. where a, b, and c are the lengths of the sides of a triangle, and A, B, and C are the opposite angles (see figure). Alhazen discovered the sum formula for the fourth power, using a method that could be generally used to determine the sum for any integral power. He used this to find the volume of a paraboloid. He could find the integral formula for any polynomial without having developed a general formula. Ibn al-Haytham (Alhazen) was a significant figure in the history of scientific method, particularly in his approach to experimentation, and has been described as the "world's first true scientist". Avicenna made rules for testing the effectiveness of drugs, including that the effect produced by the experimental drug should be seen constantly or after many repetitions, to be counted. The physician Rhazes was an early proponent of experimental medicine and recommended using control for clinical research. He said: "If you want to study the effect of bloodletting on a condition, divide the patients into two groups, perform bloodletting only on one group, watch both, and compare the results." In about 964 AD, the Persian astronomer Abd al-Rahman al-Sufi, writing in his Book of Fixed Stars, described a "nebulous spot" in the Andromeda constellation, the first definitive reference to what we now know is the Andromeda Galaxy, the nearest spiral galaxy to our galaxy. Nasir al-Din al-Tusi invented a geometrical technique called a Tusi-couple, which generates linear motion from the sum of two circular motions to replace Ptolemy's problematic equant. The Tusi couple was later employed in Ibn al-Shatir's geocentric model and Nicolaus Copernicus' heliocentric Copernican model although it is not known who the intermediary is or if Copernicus rediscovered the technique independently. 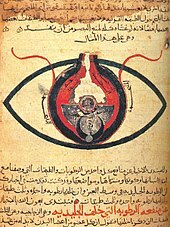 Alhazen played a role in the development of optics. One of the prevailing theories of vision in his time and place was the emission theory supported by Euclid and Ptolemy, where sight worked by the eye emitting rays of light, and the other was the Aristotelean theory that sight worked when the essence of objects flows into the eyes. Alhazen correctly argued that vision occurred when light, traveling in straight lines, reflects off an object into the eyes. Al-Biruni wrote of his insights into light, stating that its velocity must be immense when compared to the speed of sound. Al-Kindi warned against alchemists attempting the transmutation of simple, base metals into precious ones like gold in the ninth century. Al-Biruni (973–1048) estimated the radius of the earth as 6339.6 km (modern value is c. 6,371 km), the best estimate at that time. In the cardiovascular system, Ibn al-Nafis in his Commentary on Anatomy in Avicenna's Canon was the first known scholar to contradict the contention of the Galen School that blood could pass between the ventricles in the heart through the cardiac inter-ventricular septum that separates them, saying that there is no passage between the ventricles at this point. Instead, he correctly argued that all the blood that reached the left ventricle did so after passing through the lung. He also stated that there must be small communications, or pores, between the pulmonary artery and pulmonary vein, a prediction that preceded the discovery of the pulmonary capillaries of Marcello Malpighi by 400 years. The Commentary was rediscovered in the twentieth century in the Prussian State Library in Berlin; whether its view of the pulmonary circulation influenced scientists such as Michael Servetus is unclear. Modern commentators have likened medieval accounts of the "struggle for existence" in the animal kingdom to the framework of the theory of evolution. Thus, in his survey of the history of the ideas which led to the theory of natural selection, Conway Zirkle noted that al-Jahiz was one of those who discussed a "struggle for existence", in his Kitāb al-Hayawān (Book of Animals), written in the 9th century. In the 13th century, Nasir al-Din al-Tusi believed that humans were derived from advanced animals, saying, "Such humans [probably anthropoid apes] live in the Western Sudan and other distant corners of the world. They are close to animals by their habits, deeds and behavior." In 1377, Ibn Khaldun in his Muqaddimah stated, "The animal kingdom was developed, its species multiplied, and in the gradual process of Creation, it ended in man and arising from the world of the monkeys." The Banū Mūsā brothers, in their Book of Ingenious Devices, describe an automatic flute player which may have been the first programmable machine. The flute sounds were produced through hot steam and the user could adjust the device to various patterns so that they could get various sounds from it. The earliest known Islamic hospital was built in 805 in Baghdad by order of Harun Al-Rashid, and the most important of Baghdad's hospitals was established in 982 by the Buyid ruler 'Adud al-Dawla. The best documented early Islamic hospitals are the great Syro-Egyptian establishments of the 12th and 13th centuries. By the tenth century, Baghdad had five more hospitals, while Damascus had six hospitals by the 15th century and Córdoba alone had 50 major hospitals, many exclusively for the military. The typical hospital was divided into departments such as systemic diseases, surgery, and orthopedics, with larger hospitals having more diverse specialties. "Systemic diseases" was the rough equivalent of today's internal medicine and was further divided into sections such as fever, infections and digestive issues. Every department had an officer-in-charge, a presiding officer and a supervising specialist. The hospitals also had lecture theaters and libraries. Hospitals staff included sanitary inspectors, who regulated cleanliness, and accountants and other administrative staff. The hospitals were typically run by a three-man board comprising a non-medical administrator, the chief pharmacist, called the shaykh saydalani, who was equal in rank to the chief physician, who served as mutwalli (dean). Medical facilities traditionally closed each night, but by the 10th century laws were passed to keep hospitals open 24 hours a day. For less serious cases, physicians staffed outpatient clinics. Cities also had first aid centers staffed by physicians for emergencies that were often located in busy public places, such as big gatherings for Friday prayers. The region also had mobile units staffed by doctors and pharmacists who were supposed to meet the need of remote communities. Baghdad was also known to have a separate hospital for convicts since the early 10th century after the vizier ‘Ali ibn Isa ibn Jarah ibn Thabit wrote to Baghdad’s chief medical officer that "prisons must have their own doctors who should examine them every day". The first hospital built in Egypt, in Cairo's Southwestern quarter, was the first documented facility to care for mental illnesses. In Aleppo's Arghun Hospital, care for mental illness included abundant light, fresh air, running water and music. Medical students would accompany physicians and participate in patient care. Hospitals in this era were the first to require medical diplomas to license doctors. The licensing test was administered by the region's government appointed chief medical officer. The test had two steps; the first was to write a treatise, on the subject the candidate wished to obtain a certificate, of original research or commentary of existing texts, which they were encouraged to scrutinize for errors. The second step was to answer questions in an interview with the chief medical officer. Physicians worked fixed hours and medical staff salaries were fixed by law. For regulating the quality of care and arbitrating cases, it is related that if a patient dies, their family presents the doctor's prescriptions to the chief physician who would judge if the death was natural or if it was by negligence, in which case the family would be entitled to compensation from the doctor. The hospitals had male and female quarters while some hospitals only saw men and other hospitals, staffed by women physicians, only saw women. While women physicians practiced medicine, many largely focused on obstetrics. By the ninth century, there was a rapid expansion of private pharmacies in many Muslim cities. Initially, these were unregulated and managed by personnel of inconsistent quality. Decrees by Caliphs Al-Ma'mun and Al-Mu'tasim required examinations to license pharmacists and pharmacy students were trained in a combination of classroom exercises coupled with day-to-day practical experiences with drugs. To avoid conflicts of interest, doctors were banned from owning or sharing ownership in a pharmacy. Pharmacies were periodically inspected by government inspectors called muhtasib, who checked to see that the medicines were mixed properly, not diluted and kept in clean jars. Violators were fined or beaten. The theory of Humorism was largely dominant during this time. Arab physician Ibn Zuhr provided proof that scabies is caused by the itch mite and that it can be cured by removing the parasite without the need for purging, bleeding or other treatments called for by humorism, making a break with the humorism of Galen and Ibn Sina. Rhazes differentiated through careful observation the two diseases smallpox and measles, which were previously lumped together as a single disease that caused rashes. This was based on location and the time of the appearance of the symptoms and he also scaled the degree of severity and prognosis of infections according to the color and location of rashes. Al-Zahrawi was the first physician to describe an ectopic pregnancy, and the first physician to identify the hereditary nature of haemophilia. For Islamic scholars, Indian and Greek physicians and medical researchers Sushruta, Galen, Mankah, Atreya, Hippocrates, Charaka, and Agnivesa were pre-eminent authorities. In order to make the Indian and Greek tradition more accessible, understandable, and teachable, Islamic scholars ordered and made more systematic the vast Indian and Greco-Roman medical knowledge by writing encyclopedias and summaries. Sometimes, past scholars were criticized, like Rhazes who criticized and refuted Galen's revered theories, most notably, the Theory of Humors and was thus accused of ignorance. 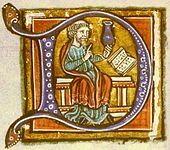 It was through 12th-century Arabic translations that medieval Europe rediscovered Hellenic medicine, including the works of Galen and Hippocrates, and discovered ancient Indian medicine, including the works of Sushruta and Charaka. Works such as Avicenna's The Canon of Medicine were translated into Latin and disseminated throughout Europe. During the 15th and 16th centuries alone, The Canon of Medicine was published more than thirty-five times. It was used as a standard medical textbook through the 18th century in Europe. 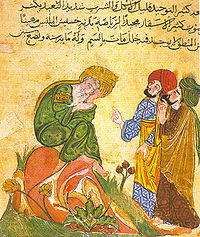 Al-Zahrawi was a tenth century Arab physician. He is sometimes referred to as the "Father of surgery". He describes what is thought to be the first attempt at reduction mammaplasty for the management of gynaecomastia and the first mastectomy to treat breast cancer. He is credited with the performance of the first thyroidectomy. Many Muslims went to China to trade, and these Muslims began to have a great economic influence on the country. Muslims virtually dominated the import/export industry by the time of the Sung dynasty (960–1279). The 13th century Persian poet Rumi wrote some of the finest Persian poetry and is still one of the best selling poets in America. Manuscript illumination was an important art, and Persian miniature painting flourished in the Persianate world. Calligraphy, an essential aspect of written Arabic, developed in manuscripts and architectural decoration. The Great Mosque of Kairouan (in Tunisia), the ancestor of all the mosques in the western Islamic world excluding Turkey and the Balkans, is one of the best preserved and most significant examples of early great mosques. Founded in 670, it dates in its present form largely from the 9th century. The Great Mosque of Kairouan is constituted of a three-tiered square minaret, a large courtyard surrounded by colonnaded porticos, and a huge hypostyle prayer hall covered on its axis by two cupolas. The beginning of construction of the Great Mosque at Cordoba in 785 marked the beginning of Islamic architecture in Spain and Northern Africa. The mosque is noted for its striking interior arches. Moorish architecture reached its peak with the construction of the Alhambra, the magnificent palace/fortress of Granada, with its open and breezy interior spaces adorned in red, blue, and gold. The walls are decorated with stylized foliage motifs, Arabic inscriptions, and arabesque design work, with walls covered in geometrically patterned glazed tiles. In 1206, Genghis Khan established a powerful dynasty among the Mongols of central Asia. During the 13th century, this Mongol Empire conquered most of the Eurasian land mass, including China in the east and much of the old Islamic caliphate (as well as Kievan Rus') in the west. The destruction of Baghdad and the House of Wisdom by Hulagu Khan in 1258 has been seen by some as the end of the Islamic Golden Age. The Ottoman conquest of the Arabic-speaking Middle East in 1516-17 placed the traditional heart of the Islamic world under Ottoman Turkish control. The rational sciences continued to flourish in the Middle East during the Ottoman period. To account for the decline of Islamic science, it has been argued that the Sunni Revival in the 11th and 12th centuries produced a series of institutional changes that decreased the relative payoff to producing scientific works. With the spread of madrasas and the greater influence of religious leaders, it became more lucrative to produce religious knowledge. This is easily refutable, as the scholars of the golden age were experts in both religious and secular fields, with many of the Islamic schools of thoughts having been established during the golden age itself. Ahmad Y. al-Hassan has rejected the thesis that lack of creative thinking was a cause, arguing that science was always kept separate from religious argument; he instead analyzes the decline in terms of economic and political factors, drawing on the work of the 14th-century writer Ibn Khaldun. Al-Hassan extended the golden age up to the 16th century, noting that scientific activity continued to flourish up until then. Several other contemporary scholars have also extended it to around the 16th to 17th centuries, and analysed the decline in terms of political and economic factors. More recent research has challenged the notion that it underwent decline even at that time, citing a revival of works produced on rational scientific topics during the seventeenth century. Economic historian Joel Mokyr has argued that Islamic philosopher al-Ghazali (1058–1111) "was a key figure in the decline in Islamic science", as his works contributed to rising mysticism and occasionalism in the Islamic world. Against this view, Saliba (2007) has given a number of examples especially of astronomical research flourishing after the time of al-Ghazali. "...regarded by some Westerners as the true father of historiography and sociology". "The founding father of Eastern Sociology". "This grand scheme to find a new science of society makes him the forerunner of many of the eighteenth and nineteenth centuries system-builders such as Vico, Comte and Marx." "As one of the early founders of the social sciences...". ^ a b c George Saliba (1994), A History of Arabic Astronomy: Planetary Theories During the Golden Age of Islam, pp. 245, 250, 256–57. New York University Press, ISBN 0-8147-8023-7. ^ a b c King, David A. (1983). "The Astronomy of the Mamluks". Isis. 74 (4): 531–55. doi:10.1086/353360. ^ a b c Hassan, Ahmad Y (1996). "Factors Behind the Decline of Islamic Science After the Sixteenth Century". In Sharifah Shifa Al-Attas (ed.). Islam and the Challenge of Modernity, Proceedings of the Inaugural Symposium on Islam and the Challenge of Modernity: Historical and Contemporary Contexts, Kuala Lumpur, August 1–5, 1994. International Institute of Islamic Thought and Civilization (ISTAC). pp. 351–99. Archived from the original on 2 April 2015. ^ Islamic Radicalism and Multicultural Politics. Taylor & Francis. 2011-03-01. p. 9. ISBN 978-1-136-95960-8. Retrieved 26 August 2012. ^ "The Ninth, Tenth and Eleventh centuries were the golden age of Islam" Life magazine, 9 May 1955, . ^ Groth, Hans, ed. (2012). Population Dynamics in Muslim Countries: Assembling the Jigsaw. Springer Science & Business Media. p. 45. ISBN 978-3-642-27881-5. ^ Rafiabadi, Hamid Naseem, ed. (2007). Challenges to Religions and Islam: A Study of Muslim Movements, Personalities, Issues and Trends, Part 1. Sarup & Sons. p. 1141. ISBN 978-81-7625-732-9. ^ Salam, Abdus (1994). Renaissance of Sciences in Islamic Countries. p. 9. ISBN 978-9971-5-0946-0. ^ a b "In Our Time – Al-Kindi, James Montgomery". bbcnews.com. 28 June 2012. Archived from the original on 2014-01-14. Retrieved May 18, 2013. ^ Brentjes, Sonja; Robert G. Morrison (2010). "The Sciences in Islamic societies". The New Cambridge History of Islam. 4. Cambridge: Cambridge University Press. p. 569. ^ "Nestorian – Christian sect". Archived from the original on 2016-10-28. Retrieved 2016-11-05. ^ Rashed, Roshdi (2015). Classical Mathematics from Al-Khwarizmi to Descartes. Routledge. p. 33. ISBN 978-0-415-83388-2. ^ "Hunayn ibn Ishaq – Arab scholar". Archived from the original on 2016-05-31. Retrieved 2016-07-12. ^ Hussein, Askary. "Baghdad 767–1258 A.D.:Melting Pot for a Universal Renaissance". Executive Intelligence Review. Archived from the original on 2017-08-24. ^ O'Leary, Delacy (1949). How Greek Science Passed On To The Arabs. Nature. 163. p. 748. Bibcode:1949Natur.163Q.748T. doi:10.1038/163748c0. ISBN 978-1-317-84748-9. ^ Sarton, George. "History of Islamic Science". Archived from the original on 2016-08-12. ^ Nancy G. Siraisi, Medicine and the Italian Universities, 1250–1600 (Brill Academic Publishers, 2001), p 134. ^ Beeston, Alfred Felix Landon (1983). Arabic literature to the end of the Umayyad period. Cambridge University Press. p. 501. ISBN 978-0-521-24015-4. Retrieved 20 January 2011. ^ "Compendium of Medical Texts by Mesue, with Additional Writings by Various Authors". World Digital Library. Archived from the original on 2014-03-04. Retrieved 2014-03-01. ^ Griffith, Sidney H. (15 December 1998). "Eutychius of Alexandria". Encyclopædia Iranica. Archived from the original on 2017-01-02. Retrieved 2011-02-07. ^ Anna Contadini, 'A Bestiary Tale: Text and Image of the Unicorn in the Kitāb naʿt al-hayawān (British Library, or. 2784)', Muqarnas, 20 (2003), 17–33 (p. 17), JSTOR 1523325. ^ Bonner, Bonner; Ener, Mine; Singer, Amy (2003). Poverty and charity in Middle Eastern contexts. SUNY Press. p. 97. ISBN 978-0-7914-5737-5. ^ Ruano, Eloy Benito; Burgos, Manuel Espadas (1992). 17e Congrès international des sciences historiques: Madrid, du 26 août au 2 septembre 1990. Comité international des sciences historiques. p. 527. ISBN 978-84-600-8154-8. ^ The School of Edessa Archived 2016-09-02 at the Wayback Machine, Nestorian.org. ^ Frew, Donald. "Harran: Last Refuge of Classical Paganism". The Pomegranate: The International Journal of Pagan Studies. 13 (9): 17–29. ^ "Harran University". Archived from the original on 2018-01-27. ^ Yazberdiyev, Dr. Almaz Libraries of Ancient Merv Archived 2016-03-04 at the Wayback Machine Dr. Yazberdiyev is Director of the Library of the Academy of Sciences of Turkmenistan, Ashgabat. ^ Lewis, Bernard (2004). From Babel to Dragomans: Interpreting the Middle East. Oxford University Press. p. 44. ^ "In Our Time – Al-Kindi, Hugh Kennedy". bbcnews.com. 28 June 2012. Archived from the original on 2014-01-14. Retrieved May 18, 2013. ^ "Islam's Gift of Paper to the West". Web.utk.edu. 2001-12-29. Archived from the original on 2015-05-03. Retrieved 2014-04-11. ^ Kevin M. Dunn, Caveman chemistry : 28 projects, from the creation of fire to the production of plastics. Universal-Publishers. 2003. p. 166. ISBN 978-1-58112-566-5. Retrieved 2014-04-11. ^ a b c d e f g h i j k l m n o Jonathan Berkey (2004). "Education". In Richard C. Martin (ed.). Encyclopedia of Islam and the Muslim World. MacMillan Reference USA. ^ a b Lapidus, Ira M. (2014). A History of Islamic Societies. Cambridge University Press (Kindle edition). p. 210. ISBN 978-0-521-51430-9. ^ Berkey, Jonathan Porter (2003). The Formation of Islam: Religion and Society in the Near East, 600–1800. Cambridge University Press. p. 227. ^ a b c d Lapidus, Ira M. (2014). A History of Islamic Societies. Cambridge University Press (Kindle edition). p. 217. ISBN 978-0-521-51430-9. ^ Hallaq, Wael B. (2009). An Introduction to Islamic Law. Cambridge University Press. p. 50. ^ Halm, Heinz. The Fatimids and their Traditions of Learning. London: The Institute of Ismaili Studies and I.B. Tauris. 1997. ^ Donald Malcolm Reid (2009). "Al-Azhar". In John L. Esposito (ed.). The Oxford Encyclopedia of the Islamic World. Oxford: Oxford University Press. doi:10.1093/acref/9780195305135.001.0001. ISBN 978-0-19-530513-5. ^ Lapidus, Ira M. (2014). A History of Islamic Societies. Cambridge University Press (Kindle edition). p. 125. ISBN 978-0-521-51430-9. ^ a b c Hallaq, Wael B. (2009). An Introduction to Islamic Law. Cambridge University Press. pp. 31–35. ^ a b c d Vikør, Knut S. (2014). "Sharīʿah". In Emad El-Din Shahin (ed.). The Oxford Encyclopedia of Islam and Politics. Oxford University Press. Archived from the original on 2017-02-02. Retrieved 2017-07-30. ^ Lapidus, Ira M. (2014). A History of Islamic Societies. Cambridge University Press (Kindle edition). p. 130. ISBN 978-0-521-51430-9. ^ a b c d e Calder, Norman (2009). "Law. Legal Thought and Jurisprudence". In John L. Esposito (ed.). The Oxford Encyclopedia of the Islamic World. Oxford: Oxford University Press. Archived from the original on 2017-07-31. Retrieved 2017-07-30. ^ Ziadeh, Farhat J. (2009). "Uṣūl al-fiqh". In John L. Esposito (ed.). The Oxford Encyclopedia of the Islamic World. Oxford: Oxford University Press. doi:10.1093/acref/9780195305135.001.0001. ISBN 978-0-19-530513-5. ^ Kamali, Mohammad Hashim (1999). John Esposito (ed.). Law and Society. The Oxford History of Islam. Oxford University Press (Kindle edition). pp. 121–22. ^ a b Lapidus, Ira M. (2014). A History of Islamic Societies. Cambridge University Press (Kindle edition). pp. 130–31. ISBN 978-0-521-51430-9. ^ a b Blankinship, Khalid (2008). Tim Winter (ed.). The early creed. The Cambridge Companion to Classical Islamic Theology. Cambridge University Press (Kindle edition). p. 53. ^ Tamara Sonn (2009). "Tawḥīd". In John L. Esposito (ed.). The Oxford Encyclopedia of the Islamic World. Oxford: Oxford University Press. doi:10.1093/acref/9780195305135.001.0001. ISBN 978-0-19-530513-5. ^ a b Dag Nikolaus Hasse (2014). "Influence of Arabic and Islamic Philosophy on the Latin West". Stanford Encyclopedia of Philosophy. Archived from the original on 2017-10-20. Retrieved 2017-07-31. ^ "In Our Time: Existence". bbcnews.com. 8 November 2007. Archived from the original on 2013-10-17. Retrieved 27 March 2013. ^ Boyer, Carl B., 1985. A History of Mathematics, p. 252. Princeton University Press. ^ https://eclass.uoa.gr/modules/document/file.php/MATH104/20010-11/HistoryOfAlgebra.pdf,[permanent dead link] "The first true algebra text which is still extant is the work on al-jabr and al-muqabala by Mohammad ibn Musa al-Khwarizmi, written in Baghdad around 825"
^ Esposito, John L. (2000-04-06). The Oxford History of Islam. Oxford University Press. p. 188. ISBN 978-0-19-988041-6. ^ Victor J. Katz, Bill Barton; Barton, Bill (October 2007). "Stages in the History of Algebra with Implications for Teaching". Educational Studies in Mathematics. 66 (2): 185–201 . doi:10.1007/s10649-006-9023-7. ^ Peter J. Lu; Paul J. Steinhardt (2007). "Decagonal and Quasi-crystalline Tilings in Medieval Islamic Architecture". Science. 315 (5815): 1106–10. Bibcode:2007Sci...315.1106L. doi:10.1126/science.1135491. PMID 17322056. ^ "Advanced geometry of Islamic art". bbcnews.com. 23 February 2007. Archived from the original on 2013-02-19. Retrieved July 26, 2013. ^ Ball, Philip (22 February 2007). "Islamic tiles reveal sophisticated maths". [email protected]. doi:10.1038/news070219-9. Archived from the original on 2013-08-01. Retrieved July 26, 2013. "Although they were probably unaware of the mathematical properties and consequences of the construction rule they devised, they did end up with something that would lead to what we understand today to be a quasi-crystal." ^ "Nobel goes to scientist who knocked down 'Berlin Wall' of chemistry". cnn.com. 16 October 2011. Archived from the original on 2014-04-13. Retrieved July 26, 2013. ^ Castera, Jean Marc; Peuriot, Francoise (1999). Arabesques. Decorative Art in Morocco. Art Creation Realisation. ISBN 978-2-86770-124-5. ^ "Abu Abd Allah Muhammad ibn Muadh Al-Jayyani". University of St.Andrews. Archived from the original on 2017-01-02. Retrieved 27 July 2013. ^ Katz, Victor J. (1995). "Ideas of Calculus in Islam and India". Mathematics Magazine. 68 (3): 163–74 [165–69, 173–74]. Bibcode:1975MathM..48...12G. doi:10.2307/2691411. JSTOR 2691411. ^ Sabra, A.I. (1989). The Optics of Ibn al-Haytham. Books I–II–III: On Direct Vision. London: The Warburg Institute, University of London. pp. 25–29. ISBN 0-85481-072-2. ^ Toomer, G.J. (1964). "Review: Ibn al-Haythams Weg zur Physik by Matthias Schramm". Isis. 55 (4): 463–65. doi:10.1086/349914. ^ Al-Khalili, Jim (2009-01-04). "BBC News". BBC News. Archived from the original on 2015-05-03. Retrieved 2014-04-11. ^ a b c Hajar, R (2013). "The Air of History (Part IV): Great Muslim Physicians Al Rhazes". Heart Views. 14 (2): 93–95. doi:10.4103/1995-705X.115499. PMC 3752886. PMID 23983918. ^ J J O'Connor; E F Robertson (1999). "Abu Arrayhan Muhammad ibn Ahmad al-Biruni". MacTutor History of Mathematics archive. University of St Andrews. Archived from the original on 21 November 2016. Retrieved 17 July 2017. ^ Pingree, David (1985). "Bīrūnī, Abū Rayḥān iv. Geography". Encyclopaedia Iranica. Columbia University. ISBN 978-1-56859-050-9. ^ a b c West, John (2008). "Ibn al-Nafis, the pulmonary circulation, and the Islamic Golden Age". Journal of Applied Physiology. 105 (6): 1877–80. doi:10.1152/japplphysiol.91171.2008. PMC 2612469. PMID 18845773. Archived from the original on 2014-09-06. Retrieved 28 May 2014. ^ Souayah, N; Greenstein, JI (2005). "Insights into neurologic localization by Rhazes, a medieval Islamic physician". Neurology. 65 (1): 125–28. doi:10.1212/01.wnl.0000167603.94026.ee. PMID 16009898. ^ Zirkle, Conway (25 April 1941). "Natural Selection before the "Origin of Species"". Proceedings of the American Philosophical Society. 84 (1): 71–123. JSTOR 984852. ^ a b Farid Alakbarov (Summer 2001). A 13th-Century Darwin? Tusi's Views on Evolution Archived 2010-12-13 at the Wayback Machine, Azerbaijan International 9 (2). ^ "Rediscovering Arabic Science". Saudi Aramco Magazine. Archived from the original on 2014-10-30. Retrieved 13 July 2016. ^ Koetsier, Teun (2001), "On the prehistory of programmable machines: musical automata, looms, calculators", Mechanism and Machine Theory, 36 (5): 589–603, doi:10.1016/S0094-114X(01)00005-2. ^ * Spengler, Joseph J. (1964). "Economic Thought of Islam: Ibn Khaldun". Comparative Studies in Society and History. 6 (3): 268–306. JSTOR 177577. .
• Boulakia, Jean David C. (1971). "Ibn Khaldûn: A Fourteenth-Century Economist". Journal of Political Economy. 79 (5): 1105–18. JSTOR 1830276. .
^ a b c d Rise and spread of Islam. Gale. 2002. p. 419. ISBN 978-0-7876-4503-8. ^ a b Philip Adler; Randall Pouwels (2007). World Civilizations. Cengage Learning. p. 198. ISBN 978-1-111-81056-6. Retrieved 1 June 2014. ^ Bedi N. Şehsuvaroǧlu (2012-04-24). "Bīmāristān". In P. Bearman; Th. Bianquis; C.E. Bosworth; et al. (eds.). Encyclopaedia of Islam (2nd ed.). Archived from the original on 2016-09-20. Retrieved 5 June 2014. ^ Mohammad Amin Rodini (7 July 2012). "Medical Care in Islamic Tradition During the Middle Ages" (PDF). International Journal of Medicine and Molecular Medicine. Archived (PDF) from the original on 2013-10-25. Retrieved 9 June 2014. ^ "Abu Bakr Mohammad Ibn Zakariya al-Razi (Rhazes) (c. 865-925)". sciencemuseum.org.uk. Archived from the original on 2015-05-06. Retrieved May 31, 2015. ^ "Rhazes Diagnostic Differentiation of Smallpox and Measles". ircmj.com. Archived from the original on August 15, 2015. Retrieved May 31, 2015. ^ Cosman, Madeleine Pelner; Jones, Linda Gale (2008). Handbook to Life in the Medieval World. Handbook to Life Series. 2. Infobase Publishing. pp. 528–30. ISBN 978-0-8160-4887-8. ^ Cyril Elgood, A Medical History of Persia and the Eastern Caliphate, (Cambridge University Press, 1951), p. 3. ^ K. Mangathayaru (2013). Pharmacognosy: An Indian perspective. Pearson education. p. 54. ISBN 978-93-325-2026-4. ^ Lock, Stephen (2001). The Oxford Illustrated Companion to Medicine. Oxford University Press. p. 607. ISBN 978-0-19-262950-0. ^ Ignjatovic M: Overview of the history of thyroid surgery. Acta Chir Iugosl 2003; 50: 9–36. ^ "History of the caravel". Nautarch.tamu.edu. Archived from the original on 2015-05-03. Retrieved 2011-04-13. ^ "Islam in China". bbcnews.com. 2 October 2002. Archived from the original on 2016-01-06. Retrieved 13 July 2016. ^ Haviland, Charles (2007-09-30). "The roar of Rumi – 800 years on". BBC News. Archived from the original on 2012-07-30. Retrieved 2011-08-10. ^ "Islam: Jalaluddin Rumi". BBC. 2009-09-01. Archived from the original on 2011-01-23. Retrieved 2011-08-10. ^ a b John Stothoff Badeau and John Richard Hayes, The Genius of Arab civilization: source of Renaissance. Taylor & Francis. 1983-01-01. p. 104. ISBN 978-0-262-08136-8. Retrieved 2014-04-11. ^ "Great Mosque of Kairouan (Qantara mediterranean heritage)". Qantara-med.org. Archived from the original on 2015-02-09. Retrieved 2014-04-11. ^ Cooper, William W.; Yue, Piyu (2008). William Wager Cooper and Piyu Yue (2008), Challenges of the Muslim world: present, future and past, Emerald Group Publishing, page 215. ISBN 978-0-444-53243-5. Retrieved 2014-04-11. ^ El-Rouhayeb, Khaled (2015). Islamic Intellectual History in the Seventeenth Century: Scholarly Currents in the Ottoman Empire and the Maghreb. Cambridge: Cambridge University Press. pp. 1–10. ISBN 978-1-107-04296-4. ^ "Religion and the Rise and Fall of Islamic Science". scholar.harvard.edu. Archived from the original on 2015-12-22. Retrieved 2015-12-20. ^ El-Rouayheb, Khaled (2006). "Opening the Gate of Verification: The Forgotten Arab-Islamic Florescence of the 17th Century". International Journal of Middle East Studies. 38: 263–81. ^ "Mokyr, J.: A Culture of Growth: The Origins of the Modern Economy. (eBook and Hardcover)". press.princeton.edu. p. 67. Archived from the original on 2017-03-24. Retrieved 2017-03-09. ^ "The Fountain Magazine – Issue – Did al-Ghazali Kill the Science in Islam?". www.fountainmagazine.com. Archived from the original on 2015-04-30. Retrieved 2018-03-08. ^ Gates, Warren E. (1967). "The Spread of Ibn Khaldûn's Ideas on Climate and Culture". Journal of the History of Ideas. 28 (3): 415–22. Bibcode:1961JHI....22..215C. doi:10.2307/2708627. JSTOR 2708627. ^ Dhaouadi, M. (1 September 1990). "Ibn Khaldun: The Founding Father of Eastern Sociology". International Sociology. 5 (3): 319–35. doi:10.1177/026858090005003007. ^ Haddad, L. (1 May 1977). "A Fourteenth-Century Theory of Economic Growth and Development". Kyklos. 30 (2): 195–213. doi:10.1111/j.1467-6435.1977.tb02006.x. Josef W. Meri (2005). Medieval Islamic Civilization: An Encyclopedia. Routledge. ISBN 0-415-96690-6. p. 1088. George Nicholas Atiyeh; John Richard Hayes (1992). The Genius of Arab Civilization. New York University Press. ISBN 0-8147-3485-5, 978-0-8147-3485-8. p. 306. Falagas, M. E.; Zarkadoulia, Effie A.; Samonis, George (1 August 2006). "Arab science in the golden age (750–1258 C.E.) and today". The FASEB Journal. 20 (10): 1581–86. doi:10.1096/fj.06-0803ufm. PMID 16873881. Starr, S. Frederick (2015). Lost Enlightenment: Central Asia's Golden Age from the Arab Conquest to Tamerlane. Princeton University. ISBN 978-0-691-16585-1. Allsen, Thomas T. (2004). Culture and Conquest in Mongol Eurasia. Cambridge University Press. ISBN 978-0-521-60270-9. Wikimedia Commons has media related to Islamic Golden Age. Khamush.com: Baghdad: Metropolis of the Abbasid Caliphate – Chapter 5, by Gaston Wiet. U.S. Library of Congress.gov: The Kirkor Minassian Collection — contains examples of Islamic book bindings.